Dental sedation is only performed by dentists who have been accredited and have completed additional training. It has been practiced for more than a century and has continued to progress for more than 40 years, with more options for patients. It was not extensively accepted in the past because of the misconception that sedation should only be used for surgeries and not for something simple like a dental procedure. To date, dental sedation has proven to be an effective and safe option for different types of dental procedures and for patients; so now it is practiced globally. 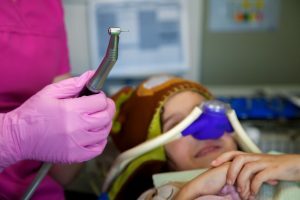 Why Give a Patient Dental Sedation? The fear of dental instruments like needles, drills, etc. Oral Sedation. A patient is given a pill that is taken the night before and another one hour before the dental appointment. IV Sedation. Intravenous Conscious Sedation is given to patients with severe anxiety to dental procedures and for patients who are having multifaceted dental procedures that takes a longer period to finish. The patient, although conscious, will not remember anything about the dental procedure. Nitrous Oxide. Nitrous oxide is also known as “laughing gas” or inhalation sedation. After placing a mask over the patient’s nose, the dentist will adjust the flow level of the nitrous oxide to sedate the patient. The patient is given 100% oxygen after the dental procedure and in a few minutes, the feeling of sedation disappears. If you have shied away from your dentist for a long time, let Dr. James Voyles or Dr. James Cook help ease your dental anxiety. You will never regret visiting Voyles Family Dental!